SunRun, a residential solar power service firm, just received a tax equity commitment from U.S. Bancorp (NYSE: USB) to support the purchase of $200 million in residential solar systems. This tax equity commitment, SunRun's fifth and largest transaction with U.S. Bancorp ($311 billion in assets), is supported by the 1603 Treasury Grant Program. It's U.S. Bancorp's largest renewable energy tax equity fund to date, according to SunRun. SunRun has raised financing for more than $600 million in solar systems from utility PG&E and U.S. Bancorp, as well as $85 million in venture capital from Accel Partners, Foundation Capital, and Sequoia Capital. SunRun installs over $1 million in residential solar every day -- owning, installing, and maintaining the solar panels for the homeowners, who pay a monthly rate for power while locking in an electric rate for 20 years. I spoke with SunRun CEO and co-founder Edward Fenster. "The $200 million shows how much scale you're going to need," said Fenster. Residential solar companies will need to buy $1 billion in systems a year to achieve minimum scale, according to Fenster, adding, "This is the year we'll see a breakout in the residential market." U.S. Bancorp has provided tax equity commitments to SolarCity and Sungevity, as well as SunRun. According to Fenster, this year we'll see other banks entering the residential solar financing fray. But it's taken some time for banks to be comfortable with the idea, according to Fenster. "Project finance groups at banks are not used to working with the 5,000 homeowners who might comprise a finance fund -- they're used to one big power plant with an investment grade utility," said the CEO. 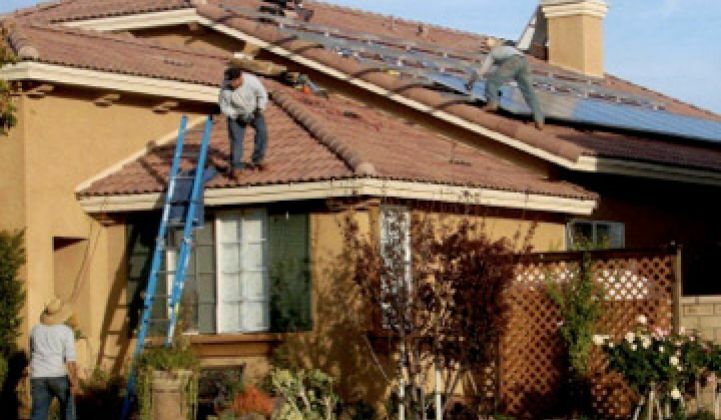 Fenster cited some statistics from the California Solar Initiative program: as of the first quarter of 2011, 28 percent of residential solar installs to date were financed by SunRun, 14 percent by SolarCity, and 1.8 percent by Sungevity. (We've covered other companies in the solar leasing business here.) SunRun has completed 11,000 customer transactions. Although surveys indicate that cost is the primary obstacle to residential solar installation, the story is a little more nuanced than that. According to Fenster, it's also very much a matter of convenience and security. People don't want to be burdened with the maintenance of the system; upfront cost is also a significant issue. The average installed cost for residential solar in the U.S. is $5.50 per watt, compared to Germany at $3.50 per watt. Germany has lower customer acquisition, an industry at greater scale, and solar installers willing to work at a lower percentage margin, according to Fenster. But the price of modules will continue to fall, as will the soft costs in the U.S. And Americans are starting to realize the value in solar rooftops for their real estate. The "falling price of solar is great for us but there is so much more work to be done on that front, such as eliminating inconsistencies in local permitting. The goal is to get to a subsidy-free solar industry as soon as possible, but until then we need the support of state rebates and federal incentives as we continue to work on reducing costs," according to Fenster. SunRun's typical customers are dual wage-earning couples in their mid-fifties who have owned their homes an average of ten years.